About The Norfolk weekly news. 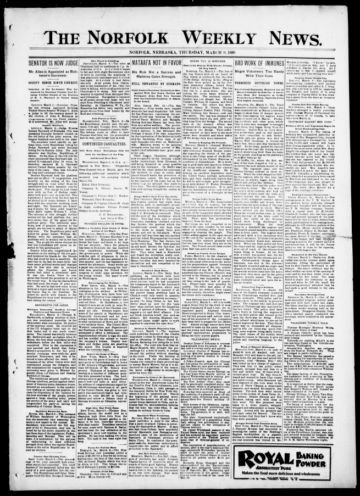 The Norfolk Weekly News-Journal was published in Madison County, Nebraska, from November 23, 1900, to October 12, 1917. Rising from the purchase of materials from the Norfolk Times, the paper's previous titles were the Elkhorn Valley News (1881-88) and the Norfolk Weekly News (1888-1900). On November 23, 1900, the Weekly News merged with the Norfolk Journal to create the Norfolk Weekly News-Journal. While the Elkhorn Valley News had featured an occasional daily edition, most of these papers appeared weekly. For much of 1892, an associated title, the Norfolk Sunday News was added. Publishers of the Weekly News-Journal and its predecessors included Norton & Sprecher (1881-85), Norton, Sprecher & Bell (1885-86), the Norfolk Publishing Company (1886-88), W. Huse & Sons (1888-93), and the Huse Publishing Company (with Gene Huse as managing editor) from 1893 to 1917. The Norfolk Weekly News-Journal remained the dominant paper in the county in terms of longevity and circulation, rivaled only by the Madison Chronicle. From the first editions of the Elkhorn Valley News to the last of the News-Journal, the paper's advanced subscription costs remained $1.50 per annum or $.75 for six months. The News-Journal varied between seven and eight columns in layout and eight to ten pages in length. Calligraphic mastheads replaced the simple text mastheads of its predecessors. Although the Weekly News had been generally Republican in its political affiliation, the News-Journal claimed political independence and gave fair coverage of Democratic, Republican, and Populist perspectives.